Aladdin Lamp Company has re-introduced the brass style wick cleaner trimmer. Quality, solid brass construction provides the best wick trimming. The brass Aladdin Lamp wick cleaner is easy to use: Remove Flame Spreader, push down and rotate clockwise to smooth out the top of the wick. Keeping your Aladdin Lamp's wick clean and level provides better light out-put, improves wick life, and creates a more solid light while preventing flickering and mantle hot spots. 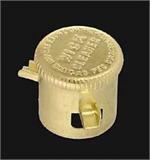 This brass wick trimmer can be used with any model of Aladdin Lamp.